Q: How I can control the displayed items by writing my own security control logics? Can the developer version allows me to edit all the generated java scripts for menu? A: You can use API functions and control the displayed items. > Can the developer version allows me to edit all> the generated java scripts for menu? Script in Single, Multiple and Developer licenses is obfuscated, youcannot modify it. 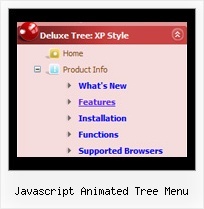 Sliding menu: iSlide Pro-X Tree Type II: Exposed Methods Sliding menus with attractive animation and graphical effects.